日本漫画 Fang :D. This is what Fang will look like in the Maximum Ride 日本漫画 version. HD Wallpaper and background images in the Maximum Ride club tagged: maximum ride fang max manga. This Maximum Ride fan art might contain 战袍 and tabard. Dude...awesome pic but weird thing is I have this same haircut, lol. But yea anyways it's not how I pictured Fang but I like it!!! i really don't like this. it makes fang look too anime. he looks like he belongs in a freaking japanese cartoon. i picture him with shorter hair and a lot less scary looking. I give this 2 stars. That hairdo is messed up tricky conspiracy, man. Just not my liking really. I think Fang looks nice. has anybody seen hiim when he gets the makeover in the manga? He's so friggen HOT! Do not like this picture of Fang AT ALL. What the heck is with the hair?! oh, jeeze. fang's hair STINKS! with it going evey-which-a-way and pulled back, it looks HORRIBLE!!! he dosn't look as menacing as i pictured him. he is suposed to look SCARY!!! he's still hot when he gets his hair cut, though!! FANG & MAX r so alike they even have BAD HAIR DAYS OFTEN!!! im not really liken the look. he looks a little too anime.... i imagine him with shorter hair. he also looks to girly! i think fang is hot...except for i really don't think his hair is THAT long. um, well the manga is awesome, EXCEPT for the hair. i mean, his hair isnt that long, and he sort o flooks like an angry chick. sorry, but, get a haircut and i'll be completely happy. Why do so many people think Fang is hot?! If any of the flock members are hot, it's Iggy! 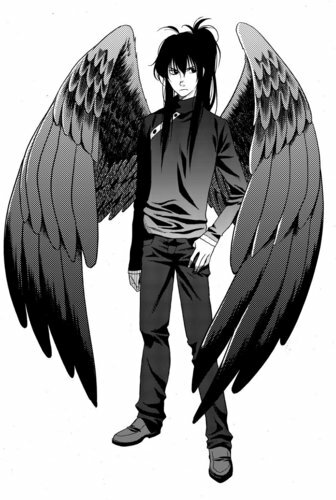 Guys, if you read Maximum Ride #2, he gets a haircut! Read it on something and you'll find out he gets a haircut that is shorter. Wayyyyy shorter. his hair is wayy too long!